After making my niece her adorable Christmas Party dress, I realized she simply NEEDED shoes to match. Baby Ballet Shoes. I know, I know – the sewing crazy in me reared its head – lol. I whipped out an older pair of my youngest daughter’s shoes that looked easy enough for basic pattern info, deconstructed them, added a ribbon, and give you baby ballet shoes! They came out super cute, and I am really excited to give them as an accessory with her handmade dress. Baby Ballet Shoes – free pattern and tutorial. The pattern is only available for Size 3 currently (6 – 9 months), as that was the size of the shoe I was working with. Based on a basic sizing chart found on-line, it looks as if each size decreases approximately 1/4″ the smaller you get. You can feel free to try to pattern grade as you see fit. **Furthermore, please refer your friends to this page when wanting to share the pattern! Do not e-mail the file directly. Why? Because you see those ads on the sidebar? That is how I get paid. ‘Pageview traffic’ and ‘affiliate links’ are a part of my salary, and I appreciate every single person who visits my site! So thank you, thank you for being here and for downloading the Baby Ballet Shoes, and for referring your friends to this site to do the same. It means the world to me :). Also – you are more than welcome to sell shoes made by using this pattern. I would be absolutely delighted to know that I am helping a seamstress out there put food on her table in her handmade shop! Completely, utterly adorable!!! I NEED to make these! For Christmas Im making all three of my nieces matching ballet bags and with the littlest of the three only being 6 months these will work perfectly into my theme. Im such a theme dork:) THANK YOU!! these are way too cute! I love them! thank you for sharing this, and for the sewing/instruction document, I am going to have to make these, for sure! I love love love these!! Come enter for a chance to win a free paper bead necklace from Uganda! I’m over from the link party (Sew much ado). These shoes are absolutely adorable! We know so many people having babies right now- I can’t wait to try them!! I would love to make my older daughter (she’s 2.5) a pair, she would love them! How would I make the pattern big enough to fit a size 9? I am sorry Lara – I really don’t know! I don’t specialize in shoes…at all. These were made from an older pair of my daughter’s shoes…good luck! Thank you! I’m making a ballerina outfit for a baby gift, and these will go perfect with it! 🙂 making them from hot pink satin. Hopefully they’ll fit at the same time as the dress. cross your fingers! This is so lovely. Thanks a lot for the tutorial. Now i can make a pair for my girl. I just made my daughter a pair of ballet slippers for her first ballet class (she’s 3). Thank you so much for the tutorial! Very cute baby shoes…When I click on the link for the pattern in the instructions, it pulls up a blank page. Thanks so much again, and hope you are having a great day! I’m in love with this ballet ODS, I want to try them, but I’m not able to download the pattern, could you send me by mail, please? I have been able at last!! I just updated the link, so it should be working now! I hope this helps – thanks! 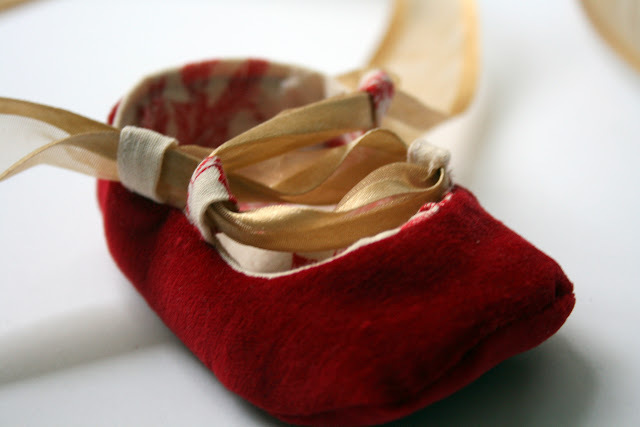 I love the little red velvet baby ballet slippers! I would love to make them and I see the tutorial instructions! However, when I try to connect to the pattern link there seems to be an error. Can you tell me how I might be able to get the pattern? Thanks So Much! 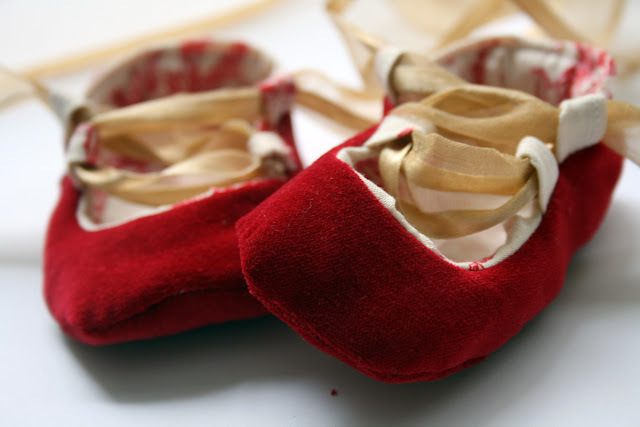 Adorable ballet shoes for the little ones. Love to get one of them. Thank you for sharing, your baby is a lucky little lady to have such a talented mommy.